In today’s Wall Street Journal drama column I report from Chicago on a rare American revival of J.B. Priestley’s An Inspector Calls. Here’s an excerpt. 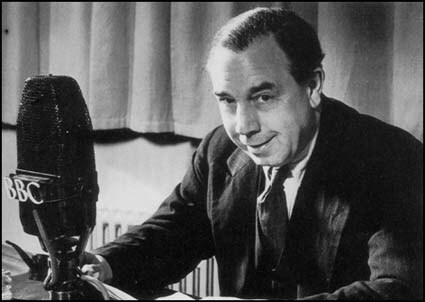 If you know who J.B. Priestley was, you’re probably British. His middlebrow novels never caught on over here, but two of them, “The Good Companions” and “Angel Pavement,” sold by the truckload in his native land, and his plays are now revived there with fast-growing frequency. One of them, “An Inspector Calls,” made it to Broadway twice, in 1947 and 1994, and the second of those productions ran for 454 performances. Since then, though, Mr. Priestley, who died in 1984, has dropped completely off the screen of American renown, and Remy Bumppo Theatre Company’s production of “An Inspector Calls” appears to be the play’s first U.S. revival in 19 years. What of it? Well, Remy Bumppo is one of Chicago’s most interesting theater troupes, and “An Inspector Calls,” in which Mr. Priestley used an old-fashioned drawing-room detective story as a vehicle for his socialist sermonizing, regularly pops up in discussions of what chroniclers of the period refer to as “Austerity Britain.” It is, one gathers, a key document in the cultural history of postwar England, and most of today’s British drama critics also believe it to be a play of quality. Set in 1912, “An Inspector Calls” unfolds in the dining room of the Birlings, a Yorkshire family whose patriarch (Roderick Peeples) is an upwardly mobile businessman who is about to marry off his daughter (Isabel Ellison) to a nobleman (Greg Matthew Anderson). Sheila Birling and her fiancé are being toasted when a police inspector (Nick Sandys) knocks on the door, announces that he is investigating the suicide of a poor young woman of the town and starts asking awkward questions. It soon emerges that everyone in the room knew the girl–two of them intimately–and had something to do with her death. “An Inspector Calls” contains a fair amount of that sort of speechmaking, the effect of which is not unlike having dull spikes hammered into your head. But whenever Mr. Priestley climbs down from his soapbox and attends to his responsibilities as a storyteller–which is most of the time–he succeeds in turning what could easily have been a droning exercise in finger-pointing into a soundly made play….